Rabbi; born at Cracow about 1665; died at Safed, Palestine, 1742. On the completion of his studies he became dayyan of Cracow. In 1708 he accepted the rabbinate of Rakow, Poland. From there he went to Brody, where he became rabbi (1714). In 1735 he went to Amsterdam in response to a call from the Ashkenazic congregation there. 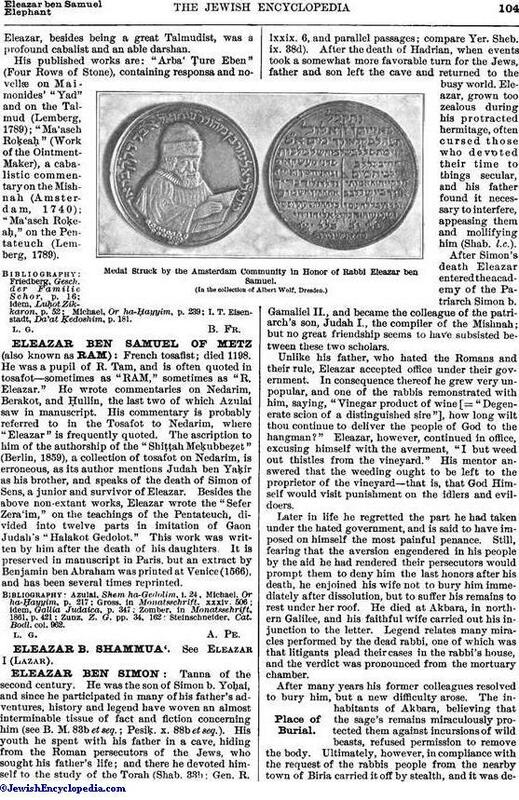 A medal was designed in his honor, one side of which exhibited his head in relief, surrounded by the words: "Eleazar ben Samuel, Rabbi of Brody," the other side containing chosen verses from the Psalms. 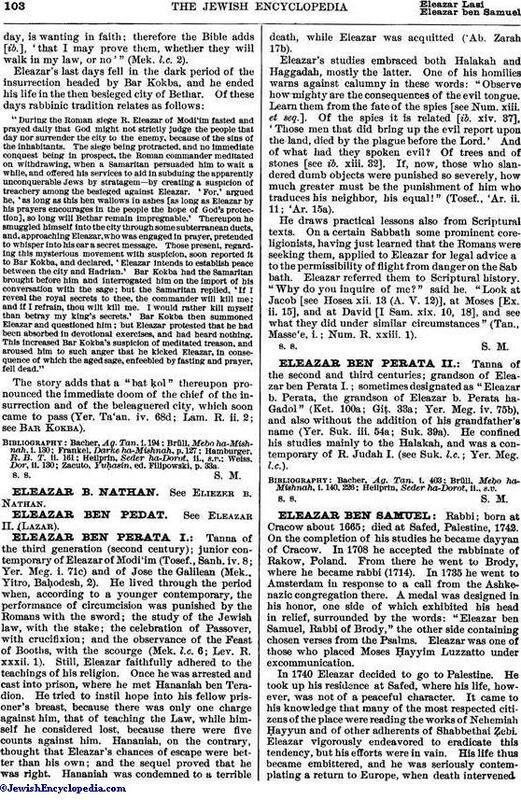 Eleazar was one of those who placed Moses Ḥayyim Luzzatto under excommunication. In 1740 Eleazar decided to go to Palestine. He took up his residence at Safed, where his life, however, was not of a peaceful character. It came to his knowledge that many of the most respected citizens of the place were reading the works of Nehemiah Ḥayyun and of other adherents of Shabbethai Ẓebi. Eleazar vigorously endeavored to eradicate this tendency, but his efforts were in vain. His life thus became embittered, and he was seriously contemplating a return to Europe, when death intervenedEleazar, besides being a great Talmudist, was a profound cabalist and an able darshan. His published works are: "Arba' Ṭure Eben" (Four Rows of Stone), containing responsa and novellæ on Maimonides' "Yad" and on the Talmud (Lemberg, 1789); "Ma'aseh Roḳeaḥ" (Work of the Ointment-Maker), a cabalistic commentary on the Mishnah (Amsterdam, 1740); "Ma'aseh Roḳeaḥ," on the Pentateuch (Lemberg, 1789). I. T. Eisenstadt, Da'at Ḳedoshim, p. 181.